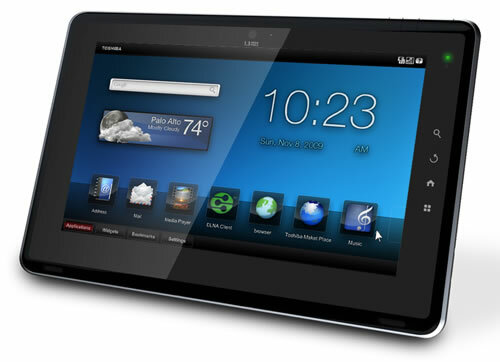 Toshiba is starting to ship it’s Folio 100 tablets in several countries in Europe. The 10.1-inch slate is equipped with a 1024×600 capacitive multitouch display and powered by a dual-core 1GHz Nvidia Tegra 2 system-on-a-chip (SoC) that can pump 1080p video over the device’s mini HDMI port. The Folio 100 comes with 16GB of internal flash storage expandable via an SD/MMC card reader. There’s also a (single) USB port, 802.11n Wi-Fi, Bluetooth 2.1 and optional 3G connectivity, a 1.3- webcam, and an accelerometer. Toshiba boasts 7 hours of battery life for the Folio. The catch? Well while the Folio runs the latest Android build, 2.2, it doesn’t ship with access to the official Android Market, just Toshiba’s very own Market Place. Bummer right? But I guess we can expect the usual suspects to give us what we need via cooked ROMs. The upside though is price. Germans will get the Wi-Fi model for €429 and €529 fort he 3G version. Italy gets these units at €399 and €499 and UK will get the Wi-Fi version for €329. No release date or pricing yet has been announced for the US and the rest of the world.